I've been enjoying spending time with my mum and been writing my #31Day challenge posts each morning. Its been a lovely week so far. Even though we haven't been doing much cause my arm is starting to play up again, It's been brilliant getting to spend time with my family. Getting to see my sister again after a whole year has been really nice and the fact that we are getting on alot better this time round makes this visit alot calmer than last. Its gonna be an emotional weekend since we are going home but I'm trying not to think about that too much. Just enjoy the time with everyone just now. Seeing her last week really puts life into perspective. Things that seem really important just don't compare and people need to just love each other and let stuff go. Family is such a blessing and it wont be there forever. 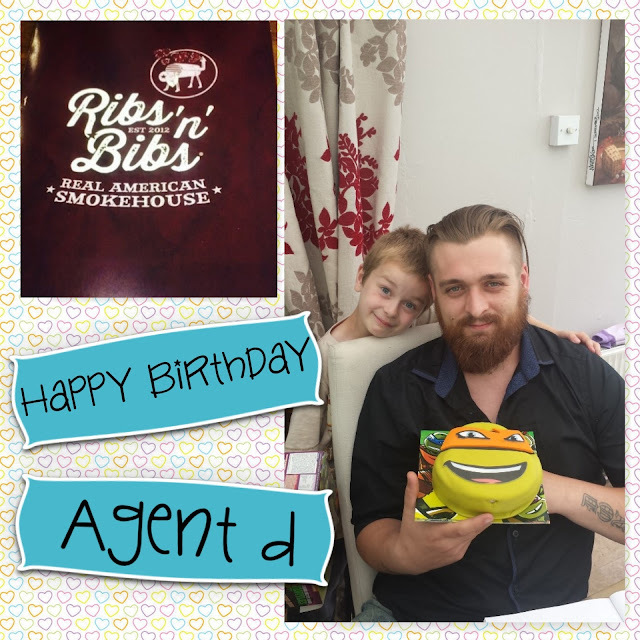 Agent D - We celebrated him birthday on Sunday while at my mums. We went to his fave restaurant Ribs 'N' Bibs and we got him a Ninja Turtle Birthday cake. I love that we get to have him in our life. He makes Agent M and i so happy and I'm grateful for him stepping into our broken little family and making us whole again.